February is the last month of winter. But, winter is not going to give up their positions. Frequent snowstorms and blizzards, high snow cover do not give full strength to use of hunting dogs, therefore the main methods of hunting in February is: traps, podkarmlivayut, STO-len, tracking, hunting with flags. February, the final month of hunting. Many of the animals at the start of the rut. In February, the wolves lose their caution. They continue to rut and wolf’s wedding. About wolves always wolves. Often break out between them of a bloody battle. Someone wins and someone eat. It’s time for a redistribution of the wolf lands. Formed new couples, groups of friends or singles pereyarkov appear in new areas where they have not seen. 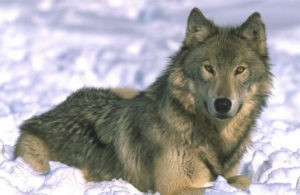 Methods of hunting the wolf are the same as in January. Is hunting with flags, and profitable paddock hunting on snowmobiles. Fox in February because of difficulties in main item on the that are increasingly appearing in large clearings, meadows, and near the stacks. 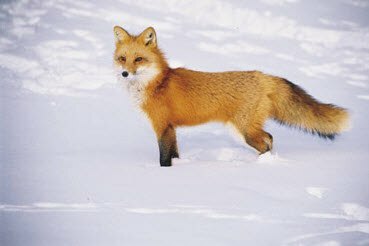 In February, Fox begins flowing, and foxes males lose their caution. Therefore, at this time especially popular hunt for the “Fox wedding”. There is this: the hunter is looking for “Fox wedding” animals disperse in different directions. At the same time, carefully watching the direction of departure of the first females. Further, following near behind runaway female hunter stops at the first suitable place and makes the ambush. After some time there lisovyy, which run on the trail of the Fox “losing his head” from the smell technoy females. Shot thereof, a Fox, a hunter can slightly move back on the trail and wait for the next male. In February, the rabbits can’t get food under the hard crust, so often feed on bark of young fruit trees. They molt begins and the rut. 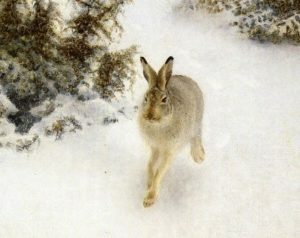 Therefore, the hunting of the hare from the very beginning of February is prohibited. 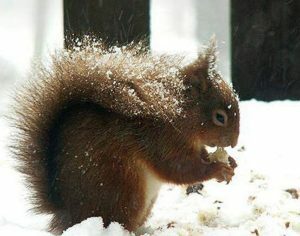 In February, frequent blizzards forced the squirrel to sit in the nest. At this time she is coming to the end of the winter supplies, and the protein falls under a deep snow to find food. This time of year do squirrels rutting begins. A whole flock of protein males pursuing a female squirrel. In February hunting for squirrels is already ending. 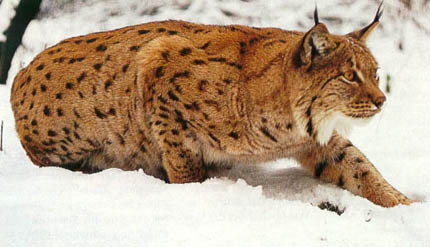 In February, the lynx are increasingly beginning to hunt for prey. As usual food — rabbit, now can easily escape from it by a solid crust. Perched on a tree, a Bobcat lies in wait for ungulates. She is not afraid to attack even deer. Suddenly jumping on his neck, lynx seeks to cut the throat. The frightened animal throws himself into the thicket, but soon loses strength and falls into the snow. Eating all the most delicious, trot out. Noticing this bait a hunter can make a blind. Because, not finding new food lynx will return to this place. In addition, the bait is likely to be released and other predators. Bear in February is still in hibernation. Many of the females appears offspring. 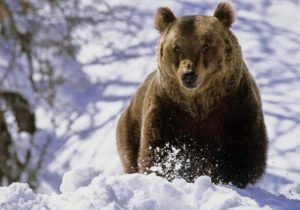 Methods of hunting bears at this season are the same as in January. In February of Martens significantly reduced the amount of food. She has to wrap large distances to find food. At this time of the year marten were most often moves at the bottom, under the trees. There is a greater chance to find rodents. Hunting the marten tracking or a husky, found this beast. Finding a marten, a dog barking, the place where she was hiding before the arrival of the owner. 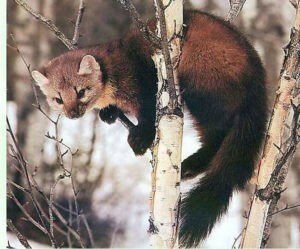 It only remains to drive the marten out of hiding. Especially getting this hunting, if the hunter had a pressed down. Then slowly he dug the place where he hid the marten nylon mesh and begins to dig out the blockage. 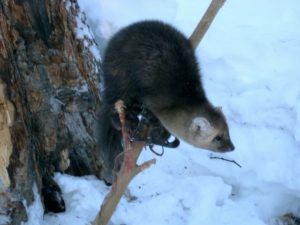 Even if the hunter manages to shoot the fleeing animal, the marten still enters the network and gets confused. Hunting sable in February a little easier. Because sable have a hard time to look for food and as a consequence to move a lot and discover yourself. But, the quality of the skins it is not the same as in January. So it makes sense to postpone the hunt for sable until next season.